The EPA has proposed reducing particulates to an extremely low level so as to save lives. The EPA claims that PM 2.5 and ozone are killing people. A new study by Stanley Young, Ph.D, proves they do not. Another scientist, Dr. Enstrom, has pointed out that the average U.S. adult inhales about 1 teaspoon of invisible PM 2.5 in 80 years. But is this tiny amount a problem? This is addressed by Dr. Young. It was impossible for Dr Young to obtain the data used in the studies that were referenced by the EPA in support of its claims that PM 2.5 and ozone kills people. That the authors of these studies refused to make their data available raises the question: What are they hiding? Unable to get the datasets from the studies used by the EPA, Dr. Young turned to a large publicly available dataset from California, possibly the largest dataset ever used in an air-pollution related study. The California records contained data from 8 basins, covering 13 years, i.e., 2000 to 2012, for daily deaths, air quality and weather. The data covered 37,000 days of exposure with 2 million death certificates. A statistical analysis of the data resulted in two charts, establishing that PM 2.5 and ozone were not related to deaths in California. This contradicts the EPA’s claim that PM 2.5 and ozone kills people. In this diagram, the left chart is for PM 2.5 and the right is for ozone. The charts show the deviation from the median. The X axis is for the level of PM 2.5 and ozone. High levels to the right, low levels to the left. The Y axis is the deviation from the median with, from top to bottom, high number of deaths on a daily basis, to low number of deaths. If PM 2.5 or ozone were causing deaths, the dots would sweep from the lower left to the upper right. Regression analysis of both PM 2.5 and ozone data verified the “no effect” conclusions. Dr. Young’s conclusions relate to acute deaths, those that occur within a few days of exposure. The EPA has claimed that PM 2.5 can cause sudden death, within hours of exposure. Meanwhile, Dr. Enstrom has concluded that there is no longterm threat either. These comments come largely from Dr. Young’s and Dr. Enstrom’s presentations at the recent Tenth International Climate Change Conference in Washington DC. Importantly, the organizations that provided the reports used by the EPA would not make their data available for analysis, which prevented other scientists from examining the data to determine whether the conclusions were verifiable. This is in stark contrast to Dr. Young, who said he will provide his data to any scientist wanting it to analyze it. Dr. Young is completely transparent, while the EPA hides its data. Furthermore, the above charts demonstrate there is no linear threshold effect. Low quantities do not cause death. The no linear threshold (LNT) concept has also been used mistakenly for radiation. LNT is not an accurate representation of risk for radiation, or for PM 2.5 and ozone. In an important conclusion, if any organization or state, such as New York, publishes information indicating that PM 2.5 or ozone causes death, it must be the result of other factors, not the size of particles or of ozone levels. This is a critical distinction. The size of the particle has no bearing on risk. Something else may be affecting people’s health. Another conclusion that can be reached from this study is that natural gas power plants have virtually no negative health effects. NGCC plants inherently have extremely low particulate matter and nitrogen oxide emissions, and, as the study demonstrates, whatever is emitted will not affect mortality rates from PM 2.5 or ozone. Based on Dr. Young’s study, these supposed savings from the prevention of premature deaths are obviously false. 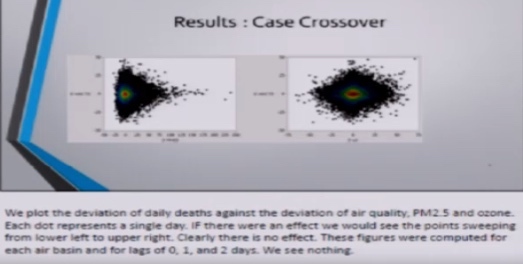 Dr. Young’s study establishes that PM 2.5 and ozone are not killing people. Other scientists are welcome to try to refute his analysis with Dr. Young’s dataset available to all scientists. The inconsistent policy, exposed here, is that the EPA, while lowering ozone limits from useful energy sources, they are also pushing more use of ethanol in the gasoline. Since Ethanol causes increased emissions of ozone, the EPA exposes it’s agenda which is contradictory and clearly not based on science. I watched a congressman question an assistant administrator on this point and she constantly dodged the question under oath. Finally she used some typical bureaucratic reply saying they might look at it while justifying increased ethanol content in fuel. She did not have a clue about energy or environmental issues and only repeated flawed EPA policy. Of course this means that Fossil fuels, cement manufacturer, etc. need to cut back making room for more questionable, low BTU ethanol. Pollution is OK if it is from “green ” energy? Excellent post with solid information. Don: Thanks for you comments. No question nearly everything the EPA does today is politically motivated. Google for the various US and global maps of PM2.5 Look at some of the maps showing the PM2.5 levels presently! The EPA regulations require emissions that are less than the actual existing values. Look at the numbers permitted in the rule. In essence they are requiring that the monitored levels of PM2.5 are LESS than the air that is being sucked into the furnace to burn the coal. Worse yet it will be coming soon to something near you. The Enviro Lawyers will force these standards on Semi-trucks, then automobiles, then emergency generators (like at your local hospital) Then your wood stove, then your furnace, then …..
Look at the revised regulations and the existing levels – it becomes obvious that the only way to stay in compliance is to shut down. And that, I think, is the real reason for the rule. usurbain: Thanks you your comments. The radical left, such as Ehrlich and McKibben actually want us to revert to a wilderness society where thousands die of disease and freezing cold. Erhlich’s book the Population Bomb says as much. You need a subscription to read.